MELBOURNE, Australia -- Angelique Kerber upset Serena Williams 6-4, 3-6, 6-4 to win the Australian Open title on Saturday, ending the six-time champion's unbeaten streak in finals here and winning a major title for the first time. Williams was an overwhelming favorite at Melbourne Park, where she had won all six previous times she'd reached the final, and was trying to equal Steffi Graf's Open-era record of 22 Grand Slam singles titles. For the second time in as many majors, though, she fell short. Williams won the Australian Open, French Open and Wimbledon titles last year before losing to Roberta Vinci in the U.S. Open semifinals. She was so close to a calendar-year Grand Slam in 2015, but no has no chance to push for that honor after losing the first major of the year. The 34-year-old Williams hadn't lost a set in the first six rounds at Melbourne Park until dropping the first on Saturday night against No. 7-seeded Kerber, who was playing in her first major final. Kerber was coming off a shaky start to the tournament when she had to save a match point in her first-round win over Misaki Doi. She said she was "one leg in the plane for Germany," at the time. Now she's the first German woman to win the title since Graf in 1994. Despite a rash of uncharacteristic unforced errors, Williams made Kerber push all the way by breaking back when the German player was serving for the match. But she couldn't hold her own serve in the next game, and hit a forehand volley long on match point, her 46th unforced error of the match. Kerber let her racket fly out of her hand and dropped on her back as the ball landed long. She got up to see Williams walking over to her side of the net, and the pair met at mid-court for a hug. 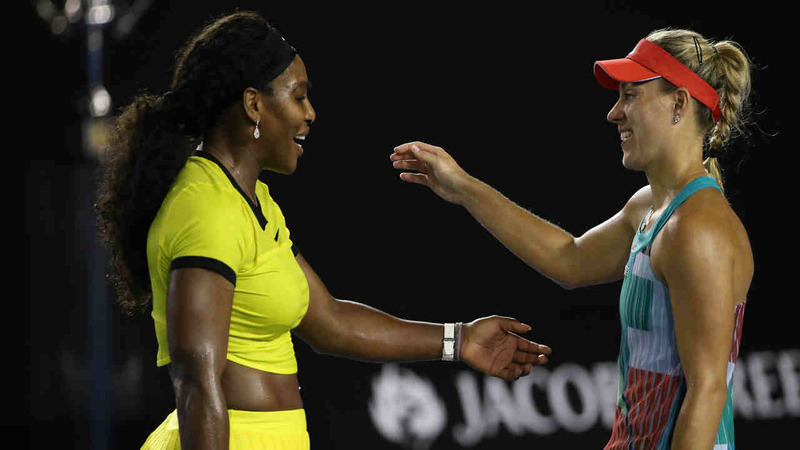 "Let me be the first to congratulate you," Williams said in her post-match speech. "Enjoy the moment. You truly deserve it." Kerber had cried as she walked over to her support team, then back to the center of the court with one arm raised. "You're really an inspiration," she told Williams.